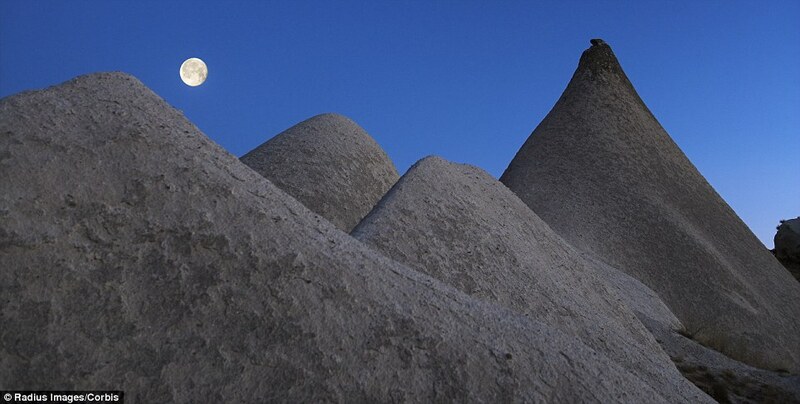 Rock Formations in Göreme Valley, Cappadocia, Turkey (for more photos, go here). Image Source: Daily Mail. 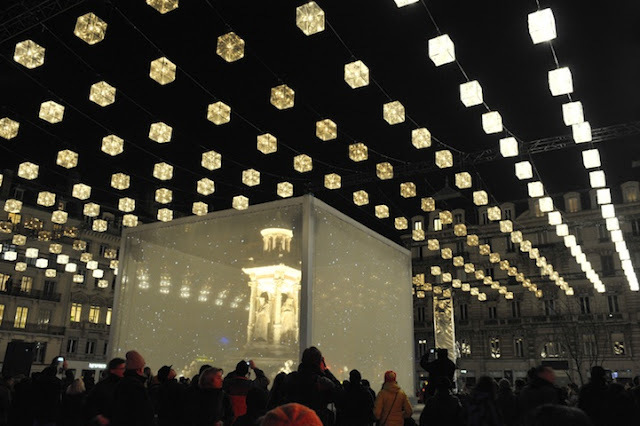 The blog is on vacation until the traditional date for Epiphany, 6 January 2014. Happy New Year! Image Source: Toby Melville via Reuters. Pandora's box. Image Source: Waging Nonviolence. The Festival of Lights in Lyon, France (or Fête des Lumières) kicked off on December 6th  bringing with it dazzling light displays by artists from around the world. “Every year we ask the artists to propose their concepts based on locations,” explained Jean-François Zurawik, General coordinator of the festival to Euronews. “We ask them to use the city as a huge backdrop, and to make proposals for parks, buildings, theaters, town hall, etc,” he said. 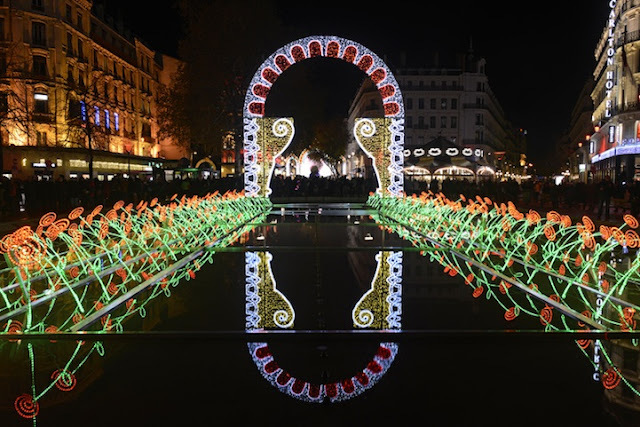 By the end of it, between three and four million visitors are expected to have walked around the French city to see the highly impressive light installations, which this year include 80 works by 120 designers ... . They include a forest filled with swarm of red lanterns and a lake sprinkled with lit lotus blossoms, both by Chinese artist Li Ll. Source for images below: My Modern Met. 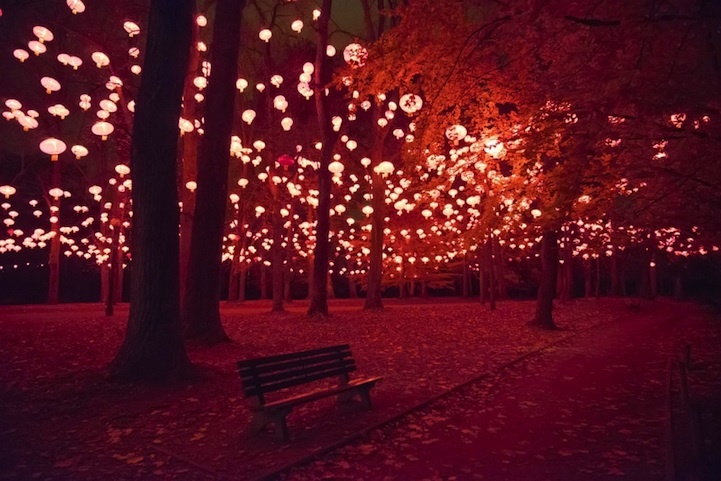 Swarm of Red Lanterns in a Forest. 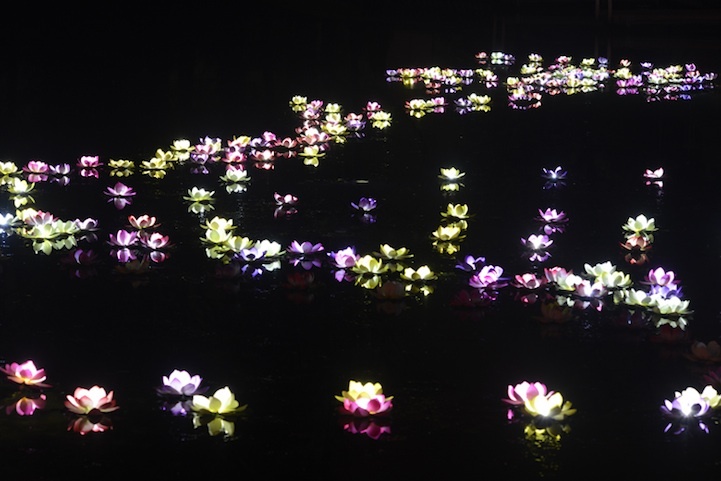 Bright Lotus Blossoms Floating Down a Lake. 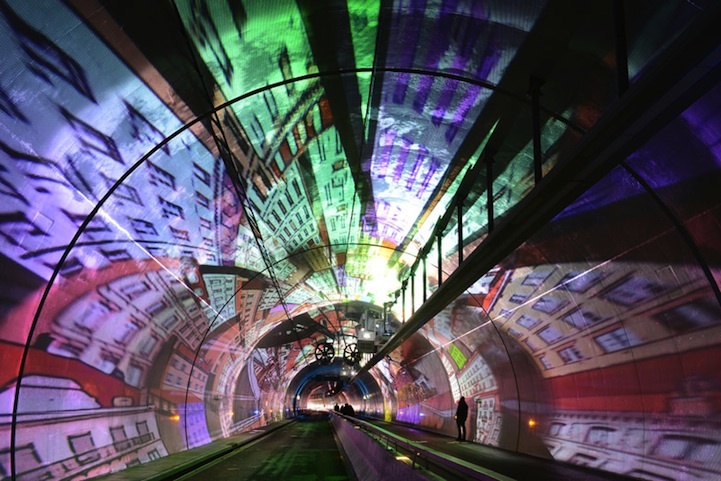 Surreal Video Projection in a Tunnel. Surrounding Buildings Projected Onto Magic Square. 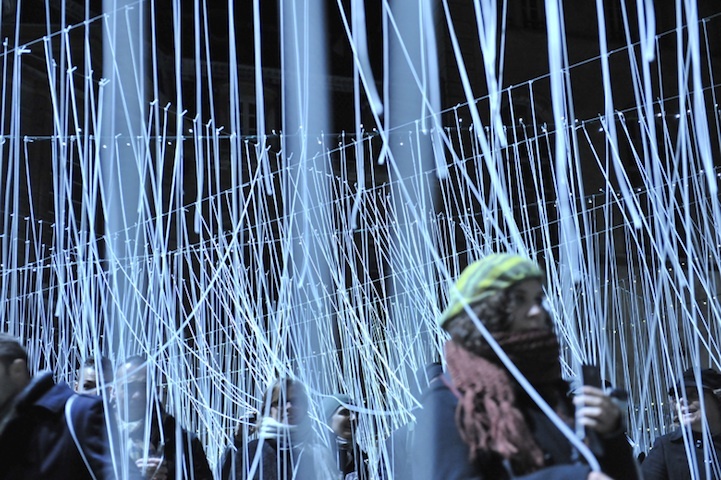 Jungle of Strings Representing Different Seasons. Below the jump, see some Millennial animated yule logs ("Re-imagined by artists around the world, this is not your parent's Yule Log"), and for even more interesting ones, go here. The now-departed Spanair (2010), followed by Royal Dutch Airlines KLM (2010) and Canada's Westjet (2013), have eased some of the stress of traveling home for the holidays with Millennial marketing gift-giving campaigns. All this gift-giving was a part of KLM Surprise, the company’s effort to not only connect with its customers on a personal level, but also an experiment in the power of social sharing. Flight attendants browsed Twitter and Foursquare, looking for people who mentioned that they were taking a KLM flight. Then, using the information the customer provided about him or herself on social media platforms, the flight attendants purchased a suitable gift and presented it to the passenger upon his/her arrival at the airport. According to the photos on the KLM Surprise website, at least 40 KLM customers were given gifts. 40 isn’t a staggering number. But news of these surprises spread like wildfire through mentions, tweets, retweets, and word of mouth. In November, the KLM Twitter feed was viewed more than one million times. Not bad for a company that wasn’t sure it could make social media work for them. KLM did their homework, and made it a priority to seek out their followers and create relationships with them. They created a website and Twitter feed dedicated to their campaign, joined Foursquare, and posted their video on their YouTube channel and the KLM Facebook Fan page. They attempted to start and join conversations on those platforms, and get a feel for what their customers are like. Sadly, this clever initiative was not enough to save Spanair from the ravages of the recession. It ceased operations in 2012. Westjet, in borrowing a page from this book in 2013, modified the original idea by having passengers tell a virtual Santa Claus what they wanted for the holidays when they checked in. This tactic diminished the unsavoury aspect of the company sifting through passengers' social media accounts to determine their private wishlists. 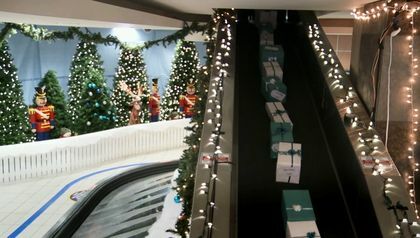 See more reports here, here, here and here; videos of the gift-giving are below the jump. 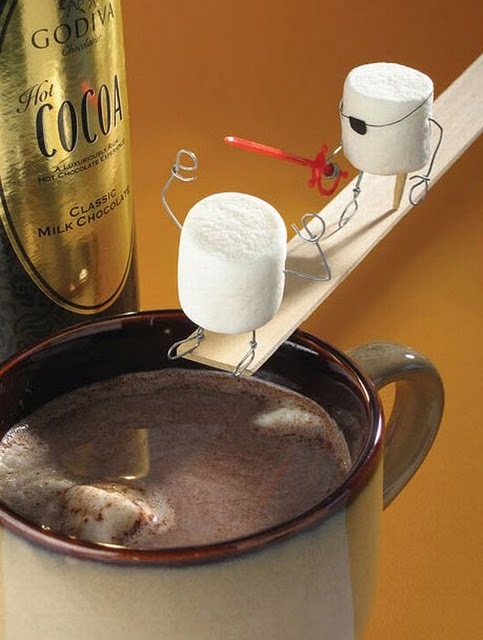 Image Source: Bentobjects via Dark Roasted Blend. Today (17:11 UTC) marks the winter solstice, the shortest day and longest night, and the onset of winter in the Northern Hemisphere. You can see the gradual lengthening of days, second by second, here. 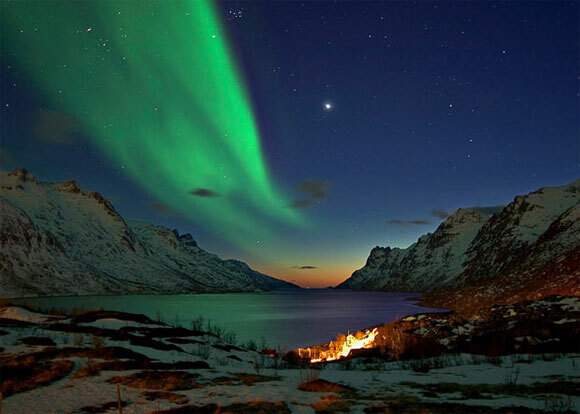 The winter solstice occurred this year in the Southern Hemisphere on June 21. Stonehenge is carefully aligned on a sight-line that points to the winter solstice sunset (opposed to New Grange, which points to the winter solstice sunrise, and the Goseck circle, which is aligned to both the sunset and sunrise). It is thought that the Winter Solstice was actually more important to the people who constructed Stonehenge than the Summer Solstice. The Winter Solstice was a time when most cattle were slaughtered (so they would not have to be fed during the winter) and the majority of wine and beer was finally fermented.The exact time for the Winter Solstice is December 21st, 17.11pm (UK time). See 2006 and 2009 videos of the great Neolithic and Bronze Age site below the jump. The earliest possible date for building at Stonehenge dates from around 3100 BCE. And to bring us back to the present, there's also a video for a 2008 Canadian winter tire ad. 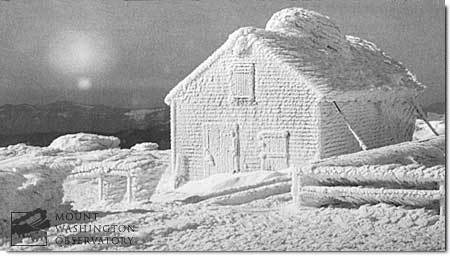 Image Source: Mount Washington Observatory via Greetings May All Your Dreams Come True. Image Source: Out of Ashes. 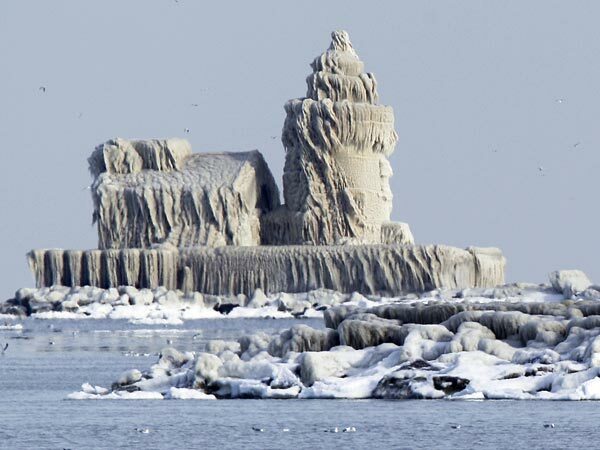 Lighthouse covered in ice in Cleveland, Ohio, on Lake Erie (16 December 2010). Image Source: National Geographic. 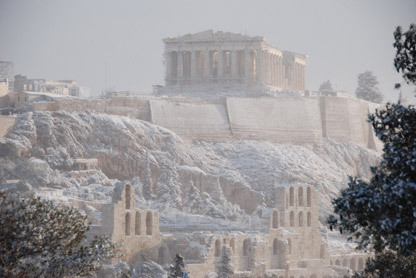 Snow in Athens (February 2008). Image Source: Kim Trathen / BBC. Live Science reports on a crypt which has been uncovered in the Sudan, in the old Christian Kingdom of Makuria, which reached its golden age from 750 to 1150 CE. 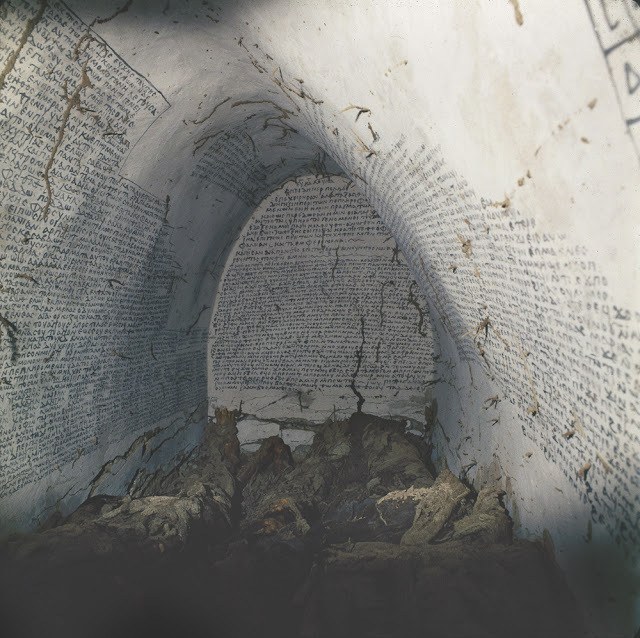 The crypt is located in what was the capital city, Old Dongola, once an important centre in medieval Nubia (see a brief history of the region here). The Live Science report is based on a research publication from 2009. The archaeologists from the University of Warsaw who excavated the crypt and environs in 2009 have a Website here; you can see their 2012 excavation of the city's royal palace, here. 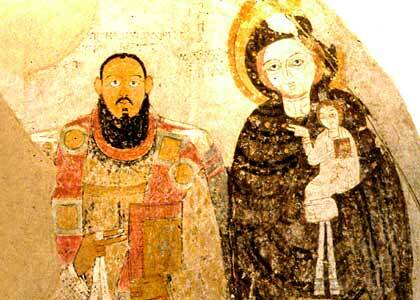 From the Kingdom of Aldoia, south of the Kingdom of Makuria, north of Khartoum: "Bishop Marianos (1005-1039) and Virgin with Child, after 1005 [CE]." Image Source: Early African Christianity. 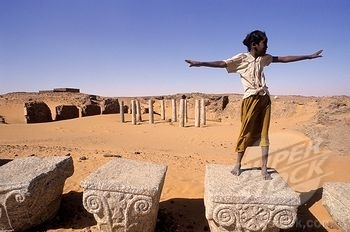 Ruins of a Coptic Christian church in Old Dongola, Sudan. Image Source: SuperStock. Image Source: Xinhua/Wang Jianmin via Yahoo. 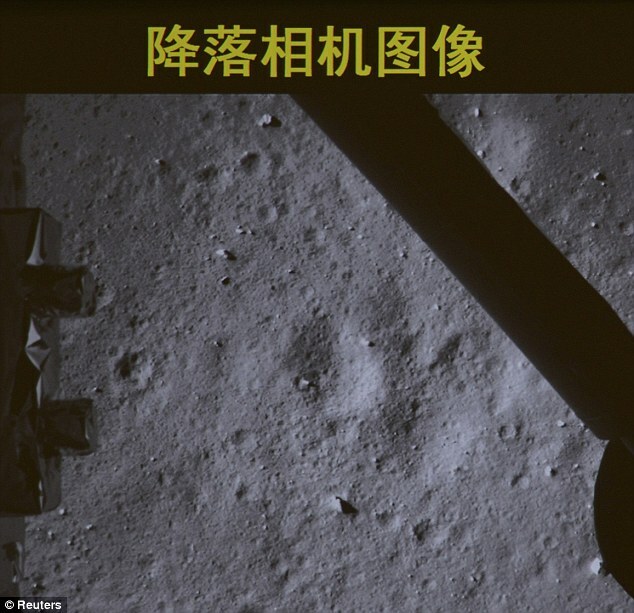 Caption for the above photo: "BEIJING, Dec. 14, 2013 (Xinhua/IANS) -- Photo taken on Dec. 14, 2013 shows a picture of the moon surface taken by the on-board camera of the lunar probe Chang'e-3 on the screen of the Beijing Aerospace Control Center in Beijing, capital of China. 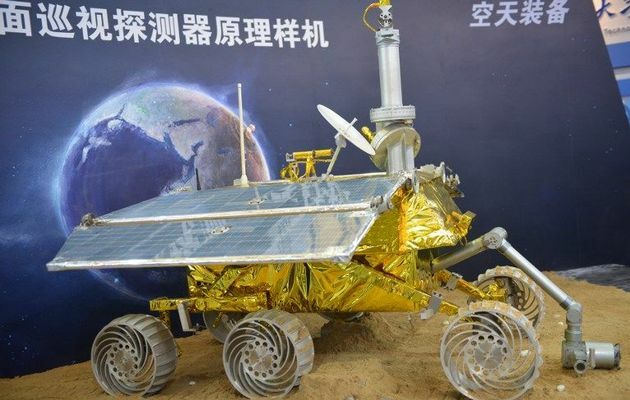 China's lunar probe Chang'e-3, with the country's first moon rover onboard, landed on the moon on Saturday night, marking the first time that China has sent a spacecraft to soft land on the surface of an extraterrestrial body." 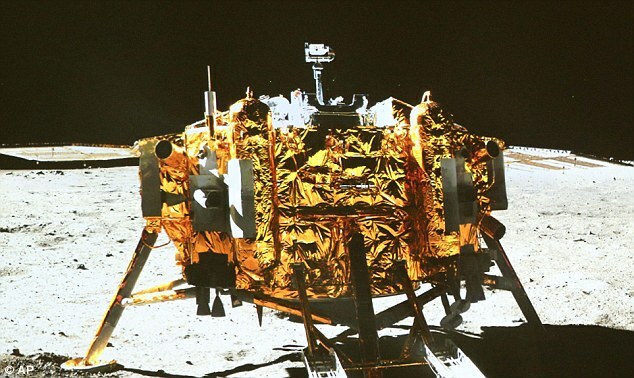 Here are some photos from AP and Reuters via the Daily Mail and Yahoo of the Chinese lander, Chang'e, and its Jade Rabbit (Yutu) rover on the lunar landscape. The full moon in December, which occurs today, is called the Cold Moon or the Long Nights Moon; its names mark the run up to the solstice. 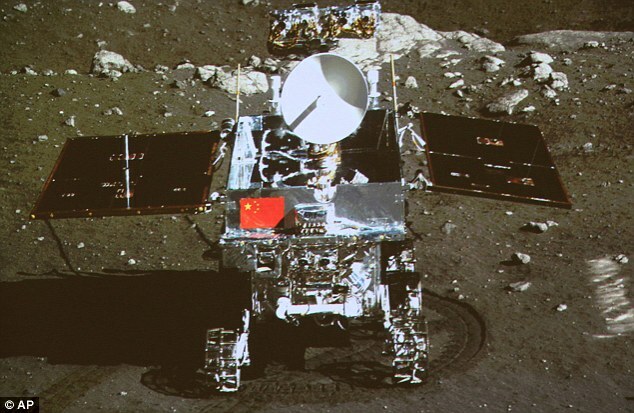 The Yutu rover, photographed by the Chang'e lander. 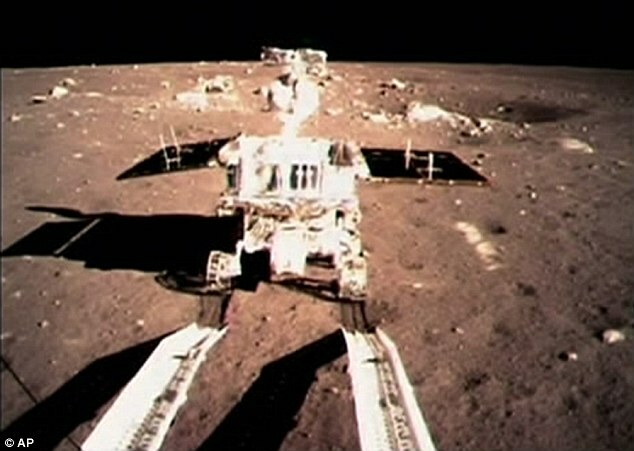 The lander, as photographed on the lunar surface by the Yutu rover. Snow at the Church of the Nativity in Bethlehem, Palestinian territories. 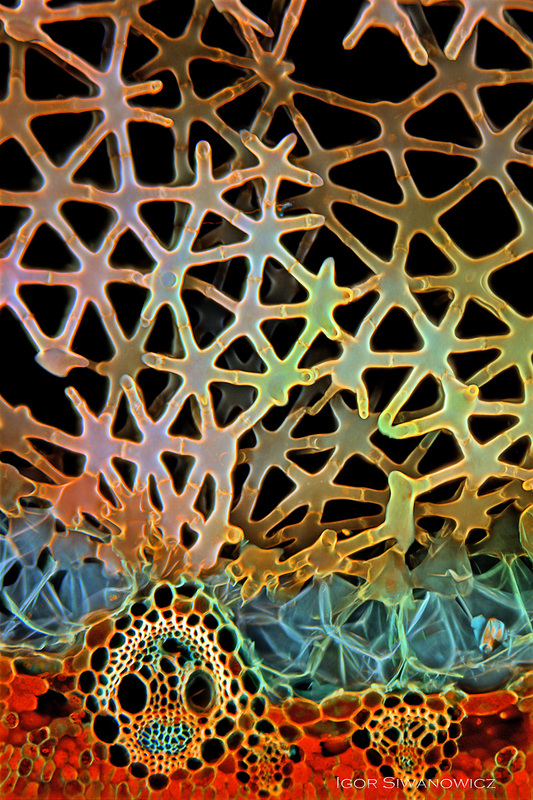 Image Source: Bob May. On 12-13 December 2013, Cairo saw its first snowfall in 112 years (hat tip: Quigley's Cabinet). 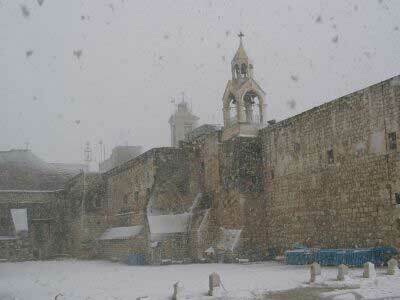 The city of Safed, Israel saw almost 1 metre, or 1 yard, of snow fall, causing deaths and operational chaos. BBC has been reporting on the compounded misery of Syrian refugees. From the pictures of snowmen across the region, only children seemed overjoyed. 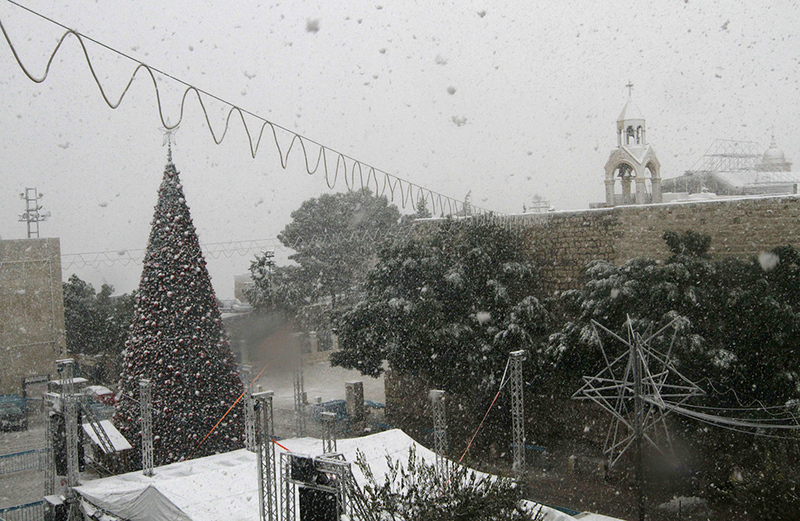 "Manger Square, with the Church of the Nativity in the background, in the West Bank town of Bethlehem." Image Source: MUSA AL-SHAER/AFP/Getty Images via Washington Post. Image Source: Peter Parks / AFP / Times Live. 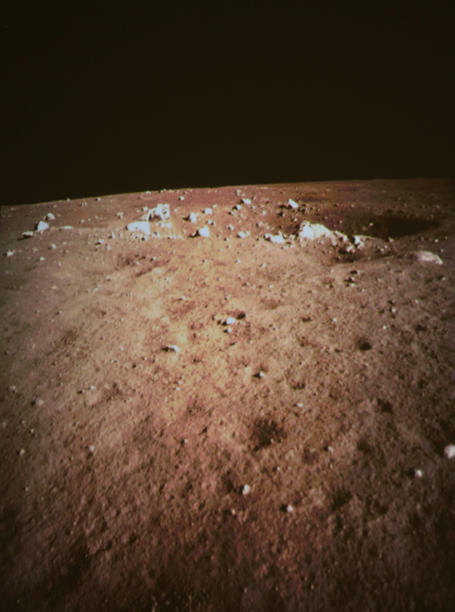 According to numerous Chinese news reports, Chang'e 3's landing on the Moon is now scheduled to begin at 21:40 Beijing time on December 14, which is 13:40 UT[, 8:40 Eastern] or 05:40 PT. That's about two hours earlier than previously stated. Once deceleration begins, the whole process will take about 750 seconds. Here is a Xinhua news site in English that may contain news updates about the landing. It is possible that this CCTV website will contain a news feed. Chinese television coverage will begin at 11:00 UT [or 6:00 a.m Eastern]. For China's English language Youtube channel, CCTV, go here. Their videos, tagged, 'Journey to the Moon' are here; the playlist will likely feature new videos tomorrow. Intrusive, ultra-groomed media so dominate perception now that everyday life has a soundtrack. Whether it is a private iPod playlist, or the general racket of Web and TV news, marketing and incessant communications, there is a constant thrum of noise behind everything. In today's post, hear a few samples from composer Joshua Baker, who writes soundtracks for films, TV, the Web and video games. His work is disarming because it fades so perfectly into the meta-background. Kristoffer Koch invested 150 kroner ($26.60) in 5,000 bitcoins in 2009, after discovering them during the course of writing a thesis on encryption. He promptly forgot about them until widespread media coverage of the anonymous, decentralised, peer-to-peer digital currency in April 2013 jogged his memory. "It said I had 5,000 bitcoins in there. Measuring that in today's rates it's about NOK5m ($886,000)," Koch told NRK. Typically bitcoins are bought using traditional currency from a bitcoin "exchanger", although due to strict anti-money laundering controls, the process can can be tricky. A user can then withdraw those bitcoins by sending them back to an exchanger like Mt Gox, the best known bitcoin exchange, in return for cash. 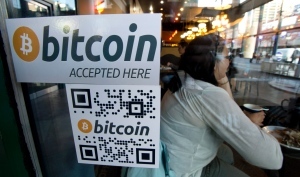 However, bitcoin is gaining more and more traction within the physical world too. It is now possible to actually spend bitcoins without exchanging them for traditional currency first in a few British pubs, including the Pembury Tavern in Hackney, London, for instance. On 29 October, the world's first bitcoin ATM also went online in Vancouver, Canada, which scans a user's palm before letting them buy or sell bitcoins for cash. ... In August, Germany recognised bitcoin as a "unit of account", allowing the country to tax users or creators of the digital currency. "Waves Coffee House is one of at least 20 businesses in Vancouver [Canada] that currently accept bitcoins." Image Source: CBC. Despite the warnings, speculation has driven the price of 1 Bitcoin to a value of between USD $600 and USD $1,000. 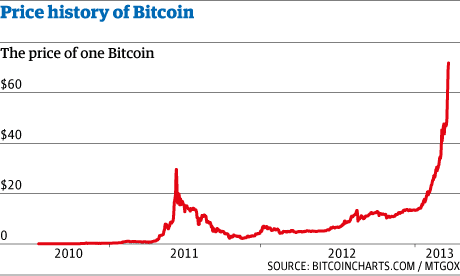 See CoinDesk's Bitcoin price index, here. But for speculators, the time to buy Bitcoins should have been between 2009 and 2012, when they were worth a few dollars. The US dollar and other major national currencies effectively trade at the same price, regardless of whether they are exchanged in Tokyo, London, New York, or any other major foreign exchange market. ... The reason for the near-perfect price synchronization we see in major currencies like the US dollar relates to an economic concept known as the ‘law of one price’. Put simply, this concept means that prices for fungible, freely-traded items like currency should be equal across all open markets. If we were to observe any material, persistent price variation between US dollars exchanged in Tokyo versus those exchanged in London, then this would be due to the existence of some cost or barrier – like variations in transaction fees, the speed at which information can travel, transportation expenses, or restrictions to the flow of funds. However, we do not observe any such variance, due to the very low frictions across the major forex markets. In contrast to the forex markets for major currencies like the US Dollar, at any given moment the bitcoin exchange rate can vary by tens or hundreds of dollars from one exchange to the next. For example, approximately a week before bitcoin first crossed the $1,000 mark on Mt. Gox, the price of bitcoin had already reached the renminbi equivalent of $1,000 on China’s largest exchange, BTC China. Following the recent announcement by Chinese authorities that banks would no longer be able to transact with bitcoin (which, in turn, triggered Baidu’s decision to suspend its acceptance of bitcoin), the price on 5th December as of 08:30 GMT had plummeted in China by a renminbi equivalent of approximately $177 more than prices on exchanges located outside of China ... .
Should the bitcoin market continue to grow in the months and years ahead, it would be reasonable to expect a decline in price fragmentation across the various exchanges as trading volume and liquidity increase. For the time being, however, relatively illiquid markets alongside the barriers which have been erected around and between the various bitcoin exchanges will continue to drive price fragmentation. 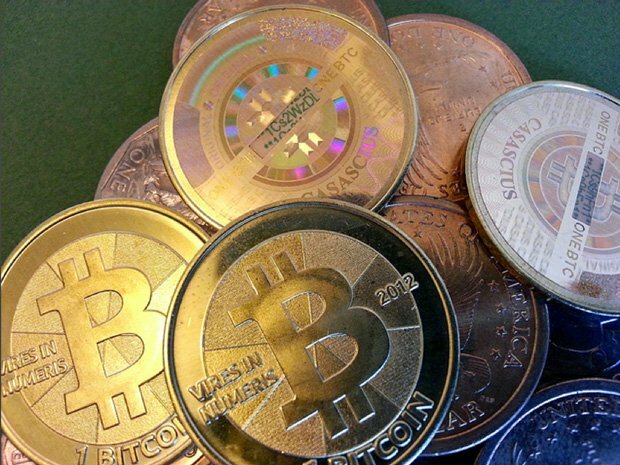 Bloomberg posted reports this week on how to buy Bitcoins and commented on the virtual currency's shaky prices. See these videos - and an interview from the Guardian with one of Bitcoin's self-proclaimed developers - below the jump. Bitcoins will be supplied, this designer declares, until 2030, after which the supply will stop. But whether he actually was a Bitcoin developer or not is debatable. The original Bitcoin protocol was designed in 2008 by a person or group of people working under the pseudonym Satoshi Nakamoto. Resurrection. Image Source: My Modern Met. 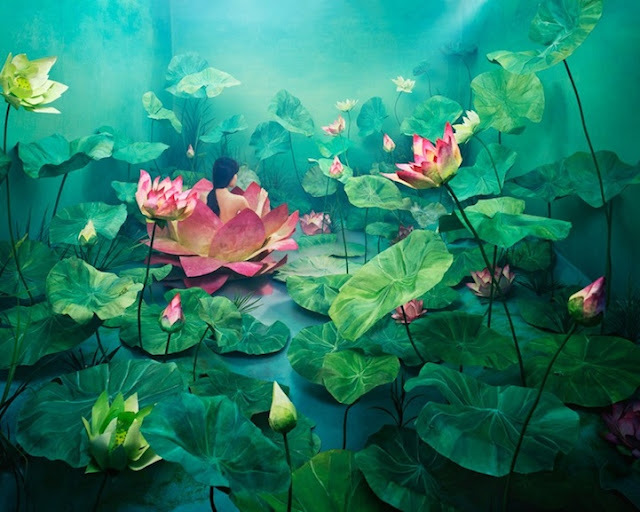 Caption for the above photograph: "Inspired by the Story of Shim Cheong, a Korea folktale as well as by Shakespeare’s Ophelia, Lee JeeYoung made this installation by painting paper lotus and flooding the room with fog and carbonic ice in order to create a mystic atmosphere. Lotus flowers grow from the impure mud to reach for the light and bloom to the rise and fall of the sun; in Asia, it bears various cultural symbolisms such as prospects and rebirth. It is also known for its purifying function. The presence of the artist in the heart of such flower is meant to convey her personal experience. 'I was born again by overcoming negative elements that had dragged me down and cleansed myself emotionally. The figure within a lotus blooming implies a stronger self who was just born again and is facing a new world'. It is this is very moment when one reaches maturity and full-potential that Lee illustrates in 'Resurrection', and, more generally speaking, throughout the entirety of her corpus." 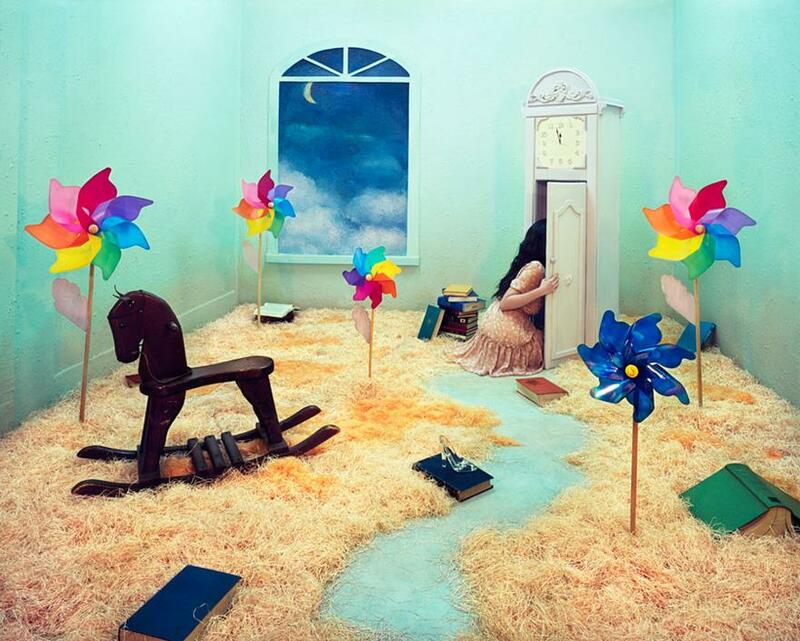 Jee Young Lee creates highly elaborate scenes that require an incredible amount of patience and absolutely no photo manipulation. For weeks and sometimes months, the young Korean artist works in the confines of her small 360 x 410 x 240 cm studio bringing to life worlds that defy all logic. In the middle of the sets you can always find the artist herself, as these are self-portraits but of the unconventional kind. Inspired by either her personal life or old Korean fables, they each have their own backstory, which of course, only adds to the intense drama. From February 7 to March 7, 2014, OPIOM Gallery in Opio, France ... present[s] a selection of Lee's ongoing body of work called Stage of Mind. Lee's constructed realities belong to the “directorial mode,” employed since the 1980's by Postmodernist photographers in repudiation of the Modernist practice that sought truth in the everyday world. Lee's “constructed image photography” may be compared to the works of German sculptor and photographer Thomas Demand, who builds life-sized models he intends to demolish after photographing them. Her “staged photography” brings to mind tableaux vivant not unlike U.S. installation artist and photographer Sandy Skoglund's orchestrated room-size installations. But in contrast to these earlier artists, Lee's subjects are deeply personal and intensely psychological. See more of Jee Young Lee's works below the jump and at this site. All works are copyrighted by the artist and are reproduced here under Fair Use. Childhood. Image Source: Bored Panda. U.S. President Barack Obama's speech today at the memorial service for the late South African President Nelson Mandela is already receiving high praise for being a well-written tribute. Unruly crowds greeted President Obama with wild applause before he began to speak. The memorial brought together many different worlds and Obama's response to this moment was possibly the most poignant and successful. To Graça Machel and the Mandela family; to President Zuma and members of the government; to heads of states and government, past and present; distinguished guests -- it is a singular honor to be with you today, to celebrate a life like no other. To the people of South Africa -- people of every race and walk of life -- the world thanks you for sharing Nelson Mandela with us. His struggle was your struggle. His triumph was your triumph. 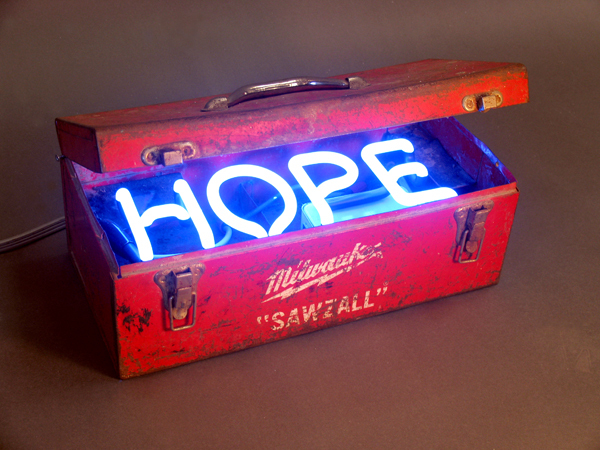 Your dignity and your hope found expression in his life. And your freedom, your democracy is his cherished legacy. It is hard to eulogize any man -- to capture in words not just the facts and the dates that make a life, but the essential truth of a person -- their private joys and sorrows; the quiet moments and unique qualities that illuminate someone’s soul. How much harder to do so for a giant of history, who moved a nation toward justice, and in the process moved billions around the world. Born during World War I, far from the corridors of power, a boy raised herding cattle and tutored by the elders of his Thembu tribe, Madiba would emerge as the last great liberator of the 20th century. Like Gandhi, he would lead a resistance movement -- a movement that at its start had little prospect for success. Like Dr. King, he would give potent voice to the claims of the oppressed and the moral necessity of racial justice. He would endure a brutal imprisonment that began in the time of Kennedy and Khrushchev, and reached the final days of the Cold War. Emerging from prison, without the force of arms, he would -- like Abraham Lincoln -- hold his country together when it threatened to break apart. And like America’s Founding Fathers, he would erect a constitutional order to preserve freedom for future generations -- a commitment to democracy and rule of law ratified not only by his election, but by his willingness to step down from power after only one term. It was precisely because he could admit to imperfection -- because he could be so full of good humor, even mischief, despite the heavy burdens he carried -- that we loved him so. He was not a bust made of marble; he was a man of flesh and blood -- a son and a husband, a father and a friend. And that’s why we learned so much from him, and that’s why we can learn from him still. For nothing he achieved was inevitable. In the arc of his life, we see a man who earned his place in history through struggle and shrewdness, and persistence and faith. He tells us what is possible not just in the pages of history books, but in our own lives as well. Mandela showed us the power of action; of taking risks on behalf of our ideals. Perhaps Madiba was right that he inherited, “a proud rebelliousness, a stubborn sense of fairness” from his father. And we know he shared with millions of black and colored South Africans the anger born of, “a thousand slights, a thousand indignities, a thousand unremembered moments … a desire to fight the system that imprisoned my people,” he said. Mandela demonstrated that action and ideas are not enough. No matter how right, they must be chiseled into law and institutions. He was practical, testing his beliefs against the hard surface of circumstance and history. On core principles he was unyielding, which is why he could rebuff offers of unconditional release, reminding the Apartheid regime that “prisoners cannot enter into contracts." And finally, Mandela understood the ties that bind the human spirit. There is a word in South Africa -- Ubuntu -- a word that captures Mandela’s greatest gift: his recognition that we are all bound together in ways that are invisible to the eye; that there is a oneness to humanity; that we achieve ourselves by sharing ourselves with others, and caring for those around us. We can never know how much of this sense was innate in him, or how much was shaped in a dark and solitary cell. But we remember the gestures, large and small -- introducing his jailers as honored guests at his inauguration; taking a pitch in a Springbok uniform; turning his family’s heartbreak into a call to confront HIV/AIDS -- that revealed the depth of his empathy and his understanding. He not only embodied Ubuntu, he taught millions to find that truth within themselves. We know that, like South Africa, the United States had to overcome centuries of racial subjugation. As was true here, it took sacrifice -- the sacrifice of countless people, known and unknown, to see the dawn of a new day. Michelle and I are beneficiaries of that struggle. But in America, and in South Africa, and in countries all around the globe, we cannot allow our progress to cloud the fact that our work is not yet done. And so we, too, must act on behalf of justice. We, too, must act on behalf of peace. 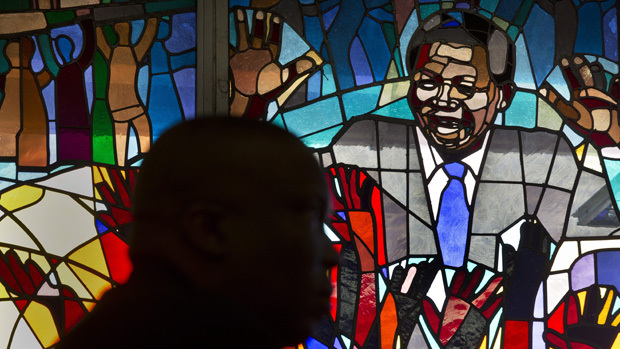 There are too many people who happily embrace Madiba’s legacy of racial reconciliation, but passionately resist even modest reforms that would challenge chronic poverty and growing inequality. There are too many leaders who claim solidarity with Madiba’s struggle for freedom, but do not tolerate dissent from their own people. And there are too many of us on the sidelines, comfortable in complacency or cynicism when our voices must be heard. The questions we face today -- how to promote equality and justice; how to uphold freedom and human rights; how to end conflict and sectarian war -- these things do not have easy answers. But there were no easy answers in front of that child born in World War I. Nelson Mandela reminds us that it always seems impossible until it is done. South Africa shows that is true. South Africa shows we can change, that we can choose a world defined not by our differences, but by our common hopes. We can choose a world defined not by conflict, but by peace and justice and opportunity. We will never see the likes of Nelson Mandela again. But let me say to the young people of Africa and the young people around the world -- you, too, can make his life’s work your own. Over 30 years ago, while still a student, I learned of Nelson Mandela and the struggles taking place in this beautiful land, and it stirred something in me. It woke me up to my responsibilities to others and to myself, and it set me on an improbable journey that finds me here today. 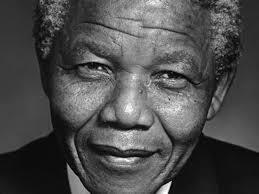 And while I will always fall short of Madiba’s example, he makes me want to be a better man. He speaks to what’s best inside us. What a magnificent soul it was. We will miss him deeply. May God bless the memory of Nelson Mandela. May God bless the people of South Africa. More Snowden Leaks: Who Watches the Watchmen? 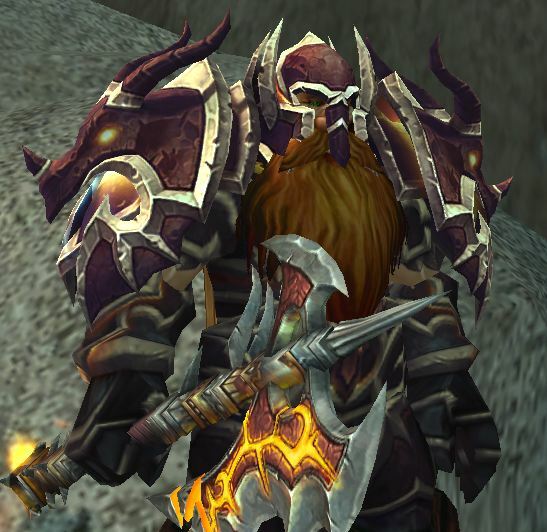 A World of Warcraft dwarf warrior. Image Source: Got Warcraft. And in 2009, the government solicited proposals for research grants intended to fund inquiries into the links between online behavior in video games and the real-world behavior of the player. It's not clear if any of the programs mentioned in the documents are still in effect. The [leaked] documents are available to view here. Music, the soul of Detroit. The Supremes: Mary Wilson, Florence Ballard and Diana Ross (1964). 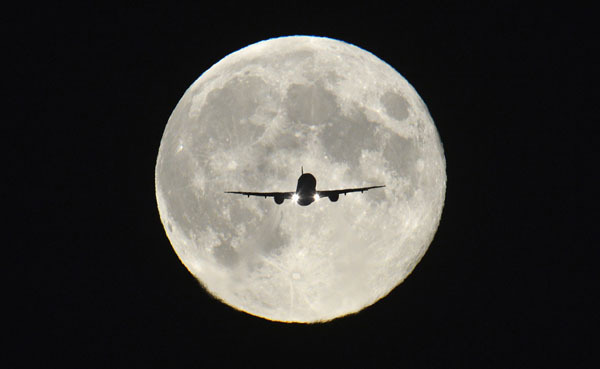 Image Source: Gilles Petard / Getty Images via HuffPo. When Canadian philosopher and communications theorist Marshall McLuhan coined the phrase, "the medium is the message," he provided an elegant shorthand for our present and future realities. Technology has revolutionized how we communicate. But does the change in how we communicate with technology really leave its stamp on what we communicate? Does the way we are using technology as a medium transform how we understand eternal questions, such as those of race, class, gender, religion, love, government or politics? "Music is the missing link in Detroit's recovery." 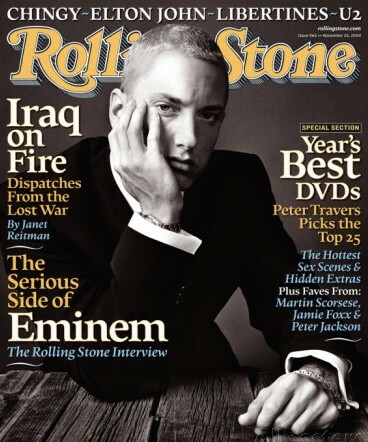 Eminem on the cover of Rolling Stone (no. 962, November 25, 2004). Image Source: allposters. It's no secret that southeastern Michigan for many decades stood as one of the most segregated and racially polarized communities in America. There is no way here to explain how huge race is as an issue in this bankrupting city and how it has related to other factors which contributed to Detroit's collapse: the economy, deindustrialization, globalization, class, corruption, drugs, crime, political and institutional breakdown, policing and education. But the focus of this post is not to get into all of that, and instead ask if technology, used as a communications medium, changes the understanding of that picture? Image Source: 2 Oceans Vibe News. Mortality and Immortality: Nelson Mandela (1918-2013), African National Congress leader in the 1990s, who spent 27 years in prison for opposing apartheid in South Africa, has died. He became that country's first black president in 1994 and was one of the great figures of the 20th century. 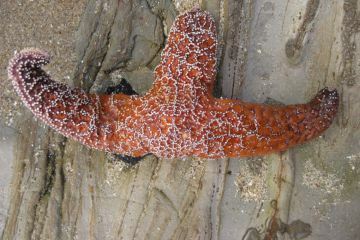 Sea stars are dying along the whole west coast of North America. 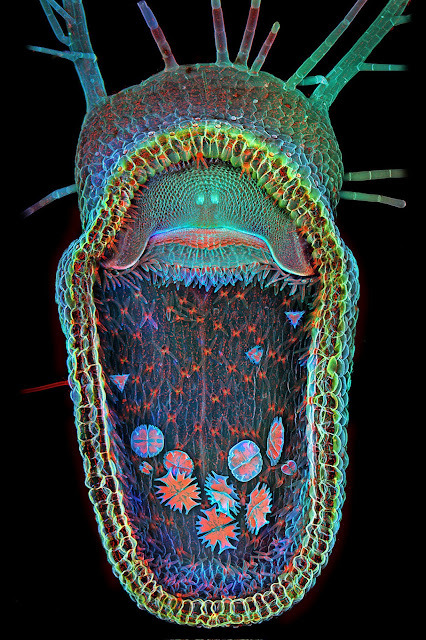 Image Source: Time. In a breakthrough that could change the lives of cancer victims, pilots and nuclear power plant workers, researchers might have found a way to protect cells from radiation damage. Dr. Isenberg and his team made the discovery that by switching off a related inhibitory pathway that controls nitric oxide, they could give animals "near immunity to record levels of radiation," he says. 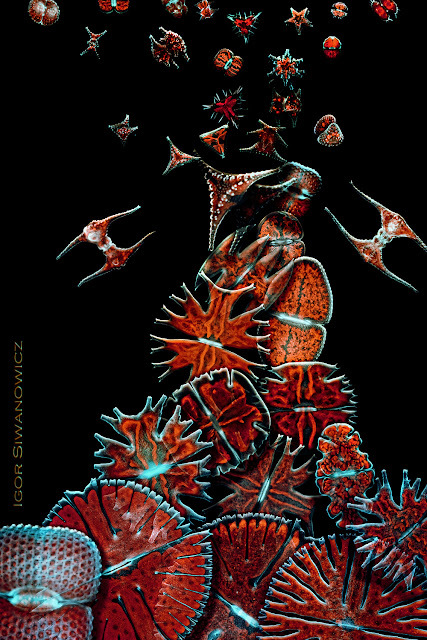 In mice, when Dr. Isenberg and his team introduced a drug that prevented a protein, thrombospondin-1, from binding to a surface cell receptor called CD47, the animals could endure almost unheard-of doses of radiation with virtually no ill effects. In cellular studies, cells could withstand up to the tested amount: 60 Gy. And in whole animal studies, mice could endure the limit they were given: 40 Gy. 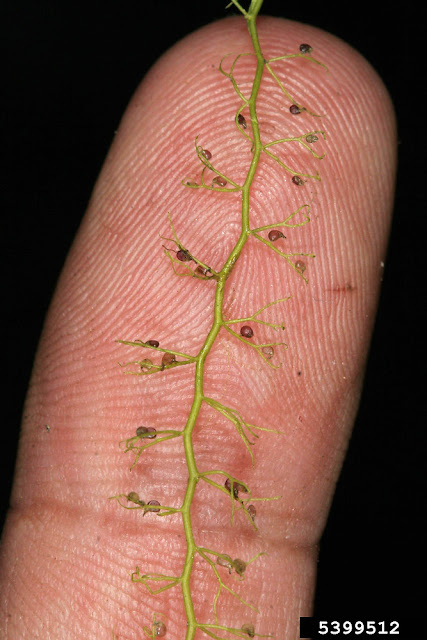 "Primarily, [on mice] people are using 5-10 Gy. This is off the scale from what they've published," he says. Shockingly, the irradiated rodents were almost completely unharmed. Other than some mild hair loss at the site of dosage, there was almost no cell death or damage when histological samples were checked. "There was no skin laceration or muscle loss," Dr. Isenberg says. "When we stained for cell death, we didn't even see significant loss of bone marrow, which is exquisitely sensitive...to radiation damage." In comparison, control mice -- who didn't get the pathway-blocking treatment -- were eaten away with tissue loss and "frank necrosis of the limbs." In other good news, the Japanese government issued a draft report on 3 December 2013; the report states that in seven years, the government expects to be able to stop dumping heavily contaminated water which TEPCO is using to cool its crippled nuclear reactors. Since March 2011, TEPCO has been dumping between 300 and 400 tonnes of contaminated water every day into the Pacific Ocean, but its officials only acknowledged that fact this past summer. 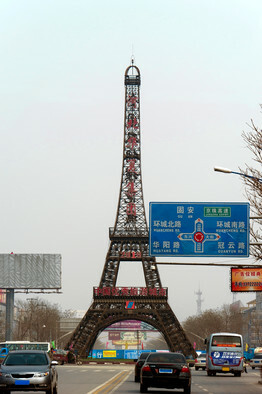 An Eiffel Tower over a road in Hebei province. 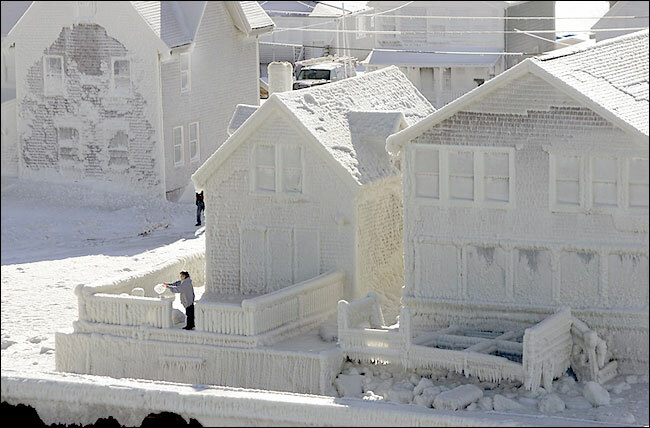 Image Source: Robert Harding/World Imagery/Corbis via WSJ. In February of this year, the Wall Street Journal reported on Chinese fakes, knock-offs, copies and duplicates of western goods, landmarks and famous buildings. It is a great example of how globalization can spawn confusion and cognitive dissonance. A caveat: some critics of related reports assumed that this story was part of an anti-Chinese wave in the western media. Even if it is, it still exemplifies the Millennial taste for twins, doppelgangers and facsimiles. Venice Water Town, Hangzhou. 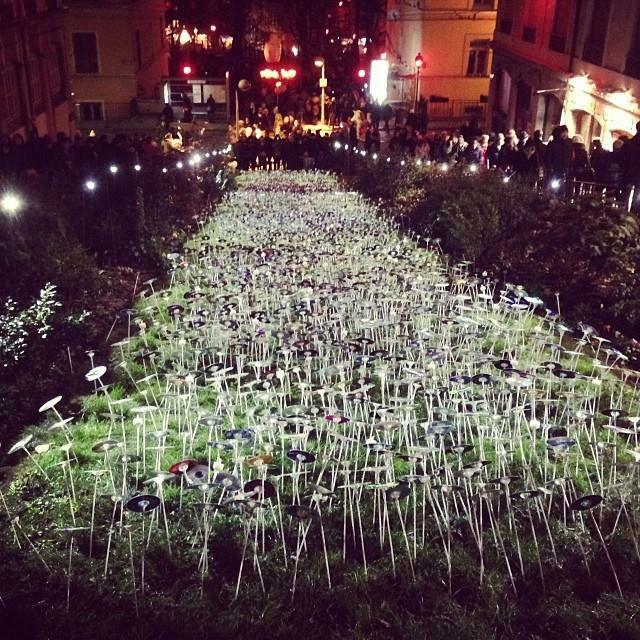 Image Source: Image Source: Bianca Bosker via Atlas Obscura. In the west, copies are derivative, inferior products. Almost always, respect goes first and foremost to an original inventor, creator, designer or architect. Copies are considered to be disrespectful and unoriginal because they violate the western principles of intellectual and commercial creation and ownership. Those principles derive from John Locke's labour theory of property, "a natural law theory that holds that property originally comes about by the exertion of labor upon natural resources." You own what you create. And if you created it first, then you get the credit for breaking ground first. There are some exceptions, particularly in American cities like Las Vegas. 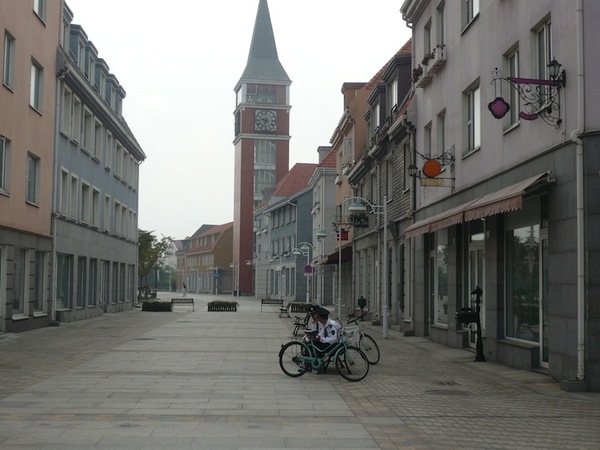 Luodian Town, a Scandinavian-themed town. Images Source: Bianca Bosker via Atlas Obscura. But generally speaking, in western eyes, Chinese fakes constitute an admission that western creations (and even culture) are superior, and all the Chinese can do is furnish pale imitations of models established by stronger societies. 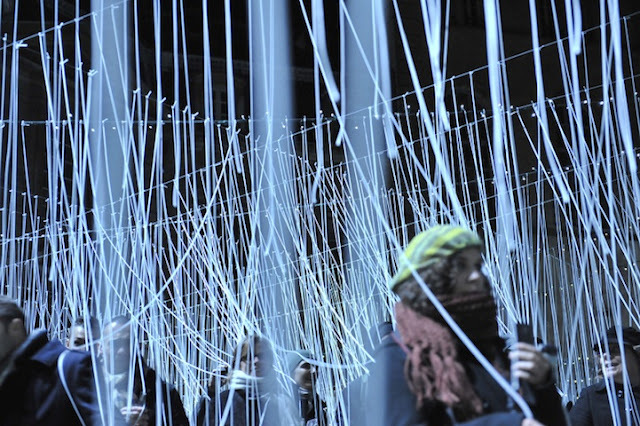 This "duplitecture" is not meant to flatter the West, nor is it a form of "self-colonization." The copies are built as monuments to China's technological prowess, affluence and power. The Chinese have seized on the icons of Western architecture as potent symbols for their own ascension to—and aspiration for—global supremacy. 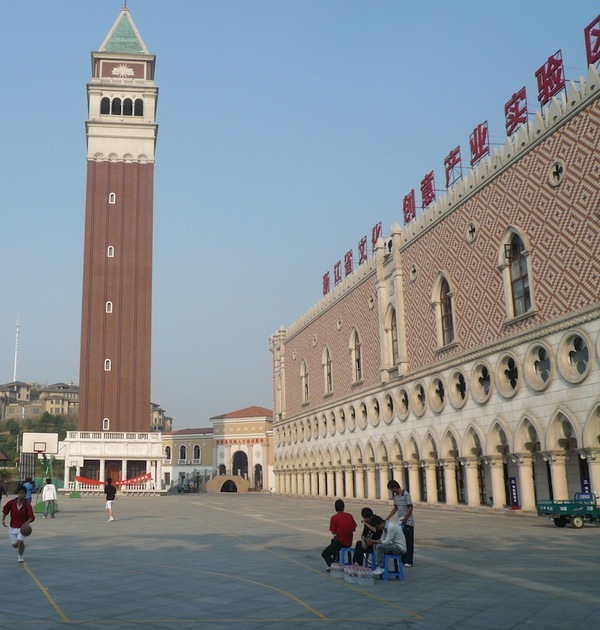 It is an impulse with deep roots in Chinese architectural tradition, dating back thousands of years. In pre-modern China, emperors demonstrated their dominance by re-creating rival territories within their own: Sprawling imperial parks, which featured flora and fauna assembled from remote lands, buttressed rulers' authority by showing their ability to both create and possess an elaborate facsimile of the known universe. China's emperors also used copycat buildings to convey their mastery—actual or anticipated—over their adversaries. In the third century B.C., the First Emperor, Qin Shi Huangdi, commemorated his conquest of six rival kingdoms by ordering that exact replicas of their palaces be built in his capital. Today, the ersatz Eiffel Towers and Chrysler Buildings symbolize China's power to control the world by transplanting Europe and the U.S. into its domain. Traditional Chinese attitudes toward replication also help to explain the trend. While Americans view imitation with disdain, the Chinese have traditionally taken a more permissive and nuanced view of it. Copying can be valued as a mark of skill and superiority. Knockoff of Tower Bridge in the city of Suzhou in Jiangsu province. Image Source: Daily Mail. As you enter Thames Town, the honking and chaos of Chinese city life fall away. There are no more street vendors selling steamed pork buns, and no more men hauling recyclables on tricycles. The road starts to wind, and then, in the distance, you see what looks like a clock tower from a Cotswold village. 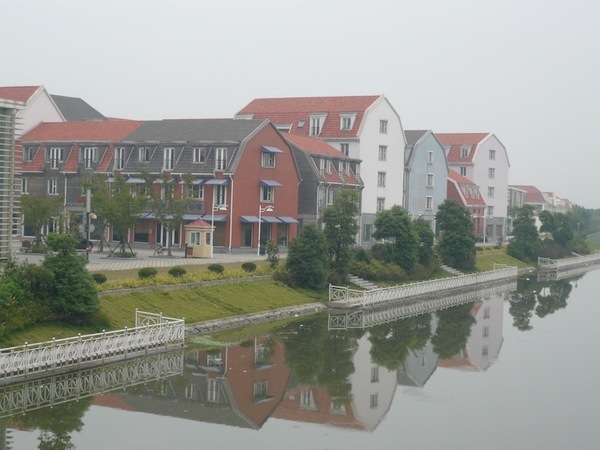 "It has this almost dreamlike quality of something European," says Tony Mackay, a British architect, and the master planner for the Thames Town housing scheme and the surrounding district of Songjiang. When local officials hired Mackay in 2001, he found farms and ducks here. Today, there are cobbled streets, pubs and half-timbered Tudor houses. There's even a statue of Winston Churchill, and a medieval meeting hall that advertises chicken wings and beer in Chinese characters. But Mackay is not happy. "It doesn't look quite right," he says. "It looks false." Mackay says the architects who took on the designs for the buildings created a pastiche, throwing together different styles, and abandoning authenticity. Some of the half-timbered houses are six storeys high, for example, and the windows on the church just don't look right, he says. "The proportions are wrong. The use of the different stones is all wrong. It would never be used like that in the genuine English church," he says. The houses in Thames Town were largely bought as investment properties, so the town has always been quiet. It is only just beginning to develop a real sense of life and community. But Fan Yu Zhe couldn't care less. ... Fan and his bride Sun Qi Yao look ... deeply into each other's eyes as a photo assistant showered them with flower petals. Thames Town is crawling with young couples who want to have their wedding photos taken here. "I love European football, so I'm very interested in things from Europe," says Fan. "I really hope I can visit the real Thames River one day, sit along the banks, drink a cup of coffee and enjoy the British sunshine." ... 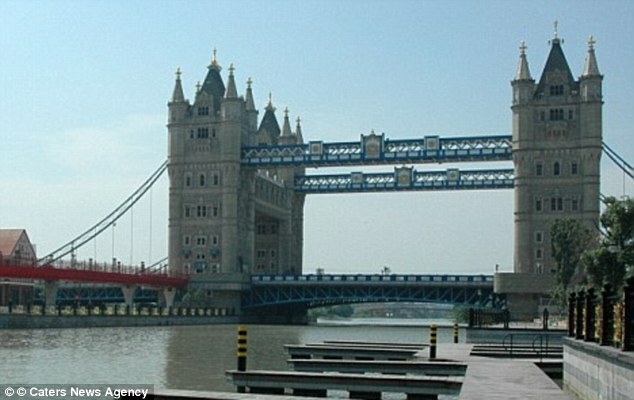 Elsewhere in China, there is a replica Eiffel Tower, a mock Tower Bridge - even a recreation of Stonehenge. 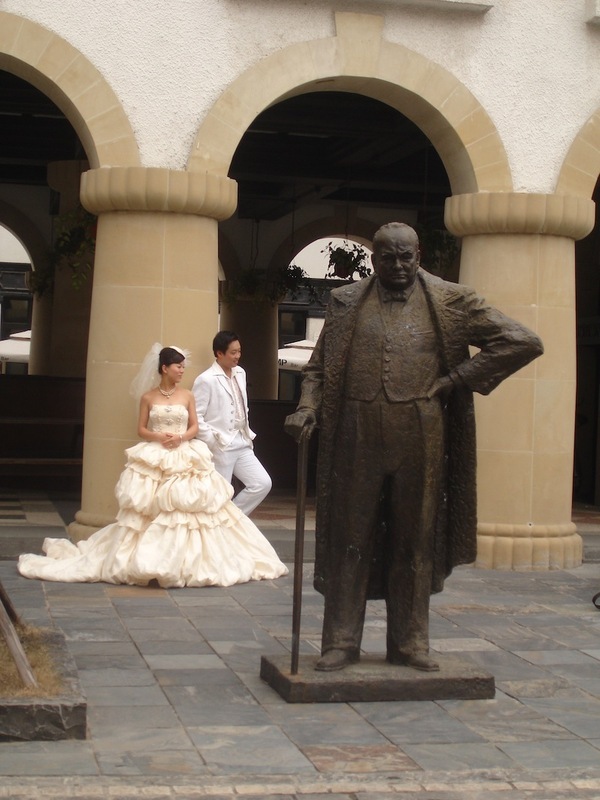 Statue of Winston Churchill in Thames Town, Shanghai. 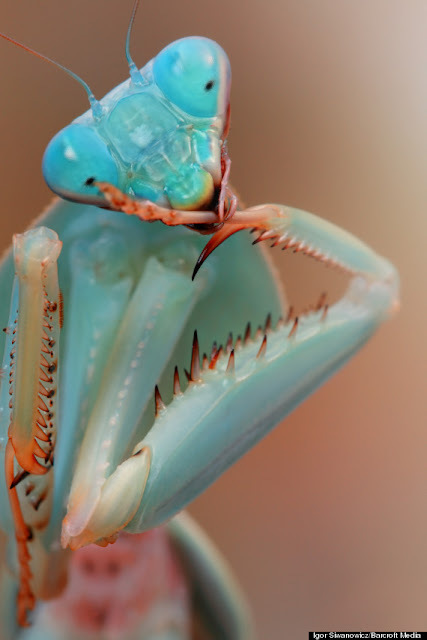 Image Source: Bianca Bosker via Atlas Obscura. I09 reported on China's copycat craze without pinpointing its underlying message. See more copycat buildings from i09 below the jump.